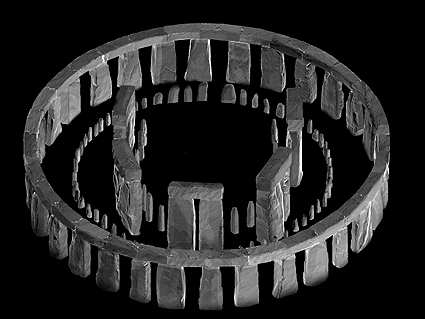 Okay, so right off we admit, these henge replicas don’t exist out in the real world. They are figments of the base 2 realm. 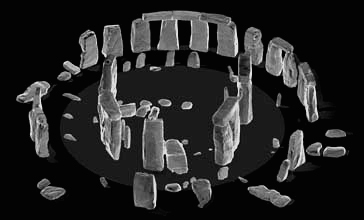 Even so, they merit a look as more evidence of the Stonehenge-building imperative. There are a number of them out there, and at first we were inclined to post them all as one. But there is enough on the site posted by reader sarsen56 for us to make a whole post just from that. At the top is a reconstruction of how Stonehenge’s stones may once have stood. The lower image is a reproduction of the stones as they are today. The page the second picture comes from has many more images of interest to Stonehenge fans and we recommend a look. We hesitated at first to post what is after all just a few runs of zeros and ones, but in a way, wasn’t the original Stonehenge a sort of grid, a way of reducing the landscape or at least the horizon to a series of zeros and ones in order to bring order to the information it contained? How to score this? Difficult to say. We like the second image very much, and the first one also has its charms. Still, they don’t exist, do they? No biscuits or cheese puffs to eat at the end of the day, no tourist revenue, no waiting for sunrise or misty weather in order to catch the perfect photo. Score: 6½ virtual druids.